We’ve got quite a lot of 2008 and 2008 R2 VMs. I’m having problems with the CPU % processor time metric. For 2008 servers it’s ‘Processor – % Processor Time’, but for 2008 R2 servers it’s ‘Processor Information / % Processor Time’. This means on the Server 2008 perspective that I often have a blank CPU graph, depending on which metric is selected and whether it’s an R2 or non R2 server! That was only the required perspective will show for each OS. Thanks. Unless I'm doing it wrong, that only half works - i think that 2008 R2 computers are also members of the 2008 computers so I get a Windows Server 2008 and a Windows Server 2008 R2 perspective for Server 2008 R2 objects! Obvious answer is to create a new group and target perspective at that, thanks for giving me the nudge in the right direction! Actually, looks like using Windows 2008 Full computer and Windows 2008 R2 Full computer groups should do it. Targeting metrics can be painful if you’re not experienced with SCOM. 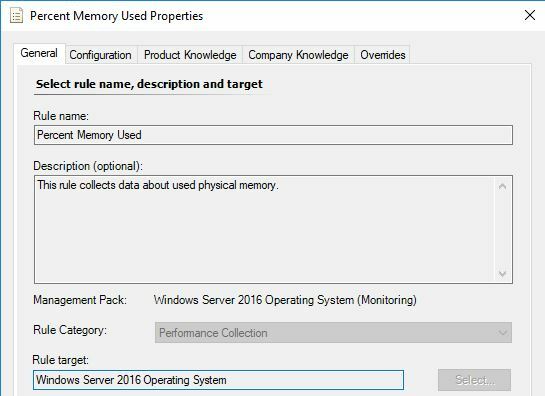 I’ll show you how to get the target for metrics using the SCOM console and PowerShell below. Where the Rule target is the class you require. And there you have it. Not easy, but probably somewhat quicker than the SCOM console (ewww).